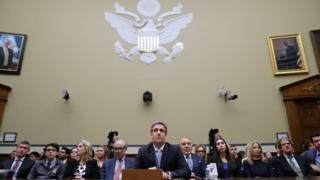 Michael Cohen, President Donald Trump's former lawyer, appeared on Wednesday before the House of Representatives Oversight Committee in Washington, DC. In his prepared remarks, he let loose with explosive accusations directed toward Mr Trump that touched on a number of controversies related to his presidency. Here is Mr Cohen's opening statement in full. Never in a million years did I imagine, when I accepted a job in 2007 to work for Donald Trump, that he would one day run for President, launch a campaign on a platform of hate and intolerance, and actually win. I regret the day I said "yes" to Mr Trump. I regret all the help and support I gave him along the way. I am ashamed of my weakness and misplaced loyalty - of the things I did for Mr Trump in an effort to protect and promote him. I am ashamed that I chose to take part in concealing Mr Trump's illicit acts rather than listening to my own conscience. I am ashamed because I know what Mr Trump is. Copies of letters I wrote at Mr Trump's direction that threatened his high school, colleges, and the College Board not to release his grades or SAT scores. The last time I appeared before Congress, I came to protect Mr Trump. Today, I'm here to tell the truth about Mr Trump. And so I lied about it, too - because Mr Trump had made clear to me, through his personal statements to me that we both knew were false and through his lies to the country, that he wanted me to lie. And he made it clear to me because his personal attorneys reviewed my statement before I gave it to Congress. I am a blessed husband of 24 years and a father to an incredible daughter and son. When I married my wife, I promised her that I would love her, cherish her, and protect her. As my father said countless times throughout my childhood, "you my wife, and you my children, are the air that I breathe." To my Laura, my Sami, and my Jake, there is nothing I wouldn't do to protect you. As many people that know me best would say, I am the person they would call at 3:00 am if they needed help. I proudly remember being the emergency contact for many of my children's friends when they were growing up because their parents knew that I would drop everything and care for them as if they were my own. For the record: Individual #1 is President Donald J Trump. Accordingly, let me now tell you about Mr Trump. I got to know him very well, working very closely with him for more than 10 years, as his Executive Vice President and Special Counsel and then personal attorney when he became President. When I first met Mr Trump, he was a successful entrepreneur, a real estate giant, and an icon. Being around Mr Trump was intoxicating. When you were in his presence, you felt like you were involved in something greater than yourself -- that you were somehow changing the world. Always stay on message. Always defend. It monopolized my life. At first, I worked mostly on real estate developments and other business transactions. Shortly thereafter, Mr Trump brought me into his personal life and private dealings. Over time, I saw his true character revealed. Mr Trump is an enigma. He is complicated, as am I. He has both good and bad, as do we all. But the bad far outweighs the good, and since taking office, he has become the worst version of himself. He is capable of behaving kindly, but he is not kind. He is capable of committing acts of generosity, but he is not generous. He is capable of being loyal, but he is fundamentally disloyal. Donald Trump is a man who ran for office to make his brand great, not to make our country great. He had no desire or intention to lead this nation - only to market himself and to build his wealth and power. Mr Trump would often say, this campaign was going to be the "greatest infomercial in political history." I knew early on in my work for Mr Trump that he would direct me to lie to further his business interests. I am ashamed to say, that when it was for a real estate mogul in the private sector, I considered it trivial. As the President, I consider it significant and dangerous. But in the mix, lying for Mr Trump was normalized, and no one around him questioned it. In fairness, no one around him today questions it, either. A lot of people have asked me about whether Mr Trump knew about the release of the hacked Democratic National Committee emails ahead of time. The answer is yes. As I earlier stated, Mr Trump knew from Roger Stone in advance about the WikiLeaks drop of emails. In July 2016, days before the Democratic convention, I was in Mr. Trump's office when his secretary announced that Roger Stone was on the phone. Mr Trump put Mr Stone on the speakerphone. Mr Stone told Mr Trump that he had just gotten off the phone with Julian Assange and that Mr Assange told Mr Stone that, within a couple of days, there would be a massive dump of emails that would damage Hillary Clinton's campaign. Mr Trump responded by stating to the effect of "wouldn't that be great." Mr Trump is a racist. The country has seen Mr Trump court white supremacists and bigots. You have heard him call poorer countries "shitholes." And yet I continued to work for him. Mr Trump is a cheat. It was my experience that Mr Trump inflated his total assets when it served his purposes, such as trying to be listed among the wealthiest people in Forbes, and deflated his assets to reduce his real estate taxes. I am sharing with you two newspaper articles, side by side, that are examples of Mr Trump inflating and deflating his assets, as I said, to suit his financial interests. These are Exhibit 2 to my testimony. As I noted, I'm giving the Committee today an article he wrote on, and sent me, that reported on an auction of a portrait of Mr Trump. This is Exhibit 3A to my testimony. Mr Trump directed me to find a straw bidder to purchase a portrait of him that was being auctioned at an Art Hamptons Event. The objective was to ensure that his portrait, which was going to be auctioned last, would go for the highest price of any portrait that afternoon. The portrait was purchased by the fake bidder for $60,000. Mr Trump directed the Trump Foundation, which is supposed to be a charitable organization, to repay the fake bidder, despite keeping the art for himself. Please see Exhibit 3B to my testimony. And it should come as no surprise that one of my more common responsibilities was that Mr Trump directed me to call business owners, many of whom were small businesses, that were owed money for their services and told them no payment or a reduced payment would be coming. When I advised Mr Trump of my success, he actually reveled in it. Mr Trump is a conman. I am giving the Committee today a copy of the $130,000 wire transfer from me to Ms Clifford's attorney during the closing days of the presidential campaign that was demanded by Ms Clifford to maintain her silence about her affair with Mr Trump. This is Exhibit 4 to my testimony. Mr Trump directed me to use my own personal funds from a Home Equity Line of Credit to avoid any money being traced back to him that could negatively impact his campaign. I did that, too - without bothering to consider whether that was improper, much less whether it was the right thing to do or how it would impact me, my family, or the public. I am going to jail in part because of my decision to help Mr Trump hide that payment from the American people before they voted a few days later. As Exhibit 5 to my testimony shows, I am providing a copy of a $35,000 check that President Trump personally signed from his personal bank account on August 1, 2017 - when he was President of the United States - pursuant to the cover-up, which was the basis of my guilty plea, to reimburse me - the word used by Mr Trump's TV lawyer -- for the illegal hush money I paid on his behalf. This $35,000 check was one of 11 check installments that was paid throughout the year - while he was President. The President of the United States thus wrote a personal check for the payment of hush money as part of a criminal scheme to violate campaign finance laws. You can find the details of that scheme, directed by Mr Trump, in the pleadings in the U.S. District Court for the Southern District of New York. I'm visiting President Trump in the Oval Office for the first time. It's truly awe-inspiring, he's showing me around and pointing to different paintings, and he says to me something to the effect of…Don't worry, Michael, your January and February reimbursement checks are coming. They were Fed-Exed from New York and it takes a while for that to get through the White House system. As he promised, I received the first check for the reimbursement of $70,000 not long thereafter. As I mentioned, I'm giving the Committee today copies of a letter I sent at Mr Trump's direction threatening these schools with civil and criminal actions if Mr Trump's grades or SAT scores were ever disclosed without his permission. These are Exhibit 6. The irony wasn't lost on me at the time that Mr Trump in 2011 had strongly criticized President Obama for not releasing his grades. As you can see inExhibit 7, Mr Trump declared "Let him show his records" after calling President Obama "a terrible student." The sad fact is that I never heard Mr Trump say anything in private that led me to believe he loved our nation or wanted to make it better. In fact, he did the opposite. During the campaign, Mr Trump said he did not consider Vietnam Veteran, and Prisoner of War, Senator John McCain to be "a hero" because he likes people who weren't captured. At the same time, Mr Trump tasked me to handle the negative press surrounding his medical deferment from the Vietnam draft. Mr Trump claimed it was because of a bone spur, but when I asked for medical records, he gave me none and said there was no surgery. He told me not to answer the specific questions by reporters but rather offer simply the fact that he received a medical deferment. Sometime in the summer of 2017, I read all over the media that there had been a meeting in Trump Tower in June 2016 involving Don Jr and others from the campaign with Russians, including a representative of the Russian government, and an email setting up the meeting with the subject line, "Dirt on Hillary Clinton." Something clicked in my mind. I remember being in the room with Mr Trump, probably in early June 2016, when something peculiar happened. Don Jr came into the room and walked behind his father's desk - which in itself was unusual. People didn't just walk behind Mr Trump's desk to talk to him. I recalled Don Jr leaning over to his father and speaking in a low voice, which I could clearly hear, and saying: "The meeting is all set." I remember Mr. Trump saying, "Ok good…let me know." What struck me as I looked back and thought about that exchange between Don Jr and his father was, first, that Mr Trump had frequently told me and others that his son Don Jr had the worst judgment of anyone in the world. And also, that Don Jr would never set up any meeting of any significance alone - and certainly not without checking with his father. I also knew that nothing went on in Trump world, especially the campaign, without Mr Trump's knowledge and approval. So, I concluded that Don Jr was referring to that June 2016 Trump Tower meeting about dirt on Hillary with the Russian representative when he walked behind his dad's desk that day -- and that Mr Trump knew that was the meeting Don Jr was talking about when he said, "That's good…let me know." To our nation, I am sorry for actively working to hide from you the truth about Mr Trump when you needed it most. For those who question my motives for being here today, I understand. I have lied, but I am not a liar. I have done bad things, but I am not a bad man. I have fixed things, but I am no longer your "fixer," Mr Trump. And, by coming today, I have caused my family to be the target of personal, scurrilous attacks by the President and his lawyer - trying to intimidate me from appearing before this panel. Mr Trump called me a "rat" for choosing to tell the truth - much like a mobster would do when one of his men decides to cooperate with the government. As Exhibit 8 shows, I have provided the Committee with copies of Tweets that Mr Trump posted, attacking me and my family - only someone burying his head in the sand would not recognize them for what they are: encouragement to someone to do harm to me and my family. I wish to especially thank Speaker Pelosi for her statements in Exhibit 9 to protect this institution and me, and the Chairman of the House Permanent Select Committee on Intelligence Adam Schiff and Chairman Cummings for likewise defending this institution and my family against the attacks by Mr Trump, and also the many Republicans who have admonished the President as well.